A few people on the ARRahmanfans group on who have been perhaps way too kind with their words on what they think of me and my singing. I know of one name because Mr Vithur who is also a major fan of Rahman sir forwarded the mail to me - Mr Mundra and the other gentleman seems to have only an alias as I see it. With all my heart, thank you for your kindness. I shall strive to live up to the compliments. Thanks Ms. Chinmayi . You deserve all this appreciation. God has blessed you with diverse talents and a great voice. May All good things happen. I feel so proud to see my name in your Blog. Thanks. Thanks Chinmayi for a special post thanking our Rahman fans. We hope you get more beautiful songs to sing for ARR and other composers. Keep on blogging. I am the Mr. Mundra who wrote about you. Have been following your singing for a while now and am truly amazed at your vocals, how you express your voice with such sweetness and sincerity...giving the song so much depth and liveliness. Please keep it up and stay confident! You truly deserve much more recognition. God Bless you always! I heard Anbil Avan and it was awesome. You deserve the biggest appreciation ever. This is why people like you. Just how many would have a small blog post thanking the fans....a gesture that goes very well with fans. Besides, you deserve it for your beautiful singing anyways!! !I did read through some of the earlier blogs and all I can say is "Thank You and Keep singing and make us smile"
Thanks for mentioning the yahoo grps ! It feels nice to leave a comment in your blog. I like your singing sooo much. Vaarayo Vaarayo song is more than just amazing. You did an awesome job in Anbil Avan also. You have got such a great talent. I wish all the success in your life..GOD BLESS YOU!! You deserve it! I can't stop listening to 'Anbil Avan'. You and Devan have done a tremendous job, esp the 'oru vanavil' and 'mudiyaadhe...' parts. I am a great great fan of your singing. I pray God that God bless you with More and More songs to sing under ARR and others. The Unplugged VTV songs were awesome. I just listened to " Anbil Avan" & it is A-w-E-S-O-M-E! You deserve all the recognitions! Hi...How are u doing? Howz Mother! U take care bye!
" In every thing give your Thanks " .Whenever i visits to my native place i am seeing the sticker . By giving thanks to your fans , you are remembering the sticker words to me and also placing yourself to the good people "s heart. Wanted to congratulate you on being part of the vinnaithandi varuvaaya album. It’s a terrific blast from Rahman !! Have been waiting for it for long and the audio launch at Chennai was a treat to watch (on Telly). I heard Anbil Avan song and your voice is really amazing. I am hearing this song for about 15-20 times daily and you can imagine how this song and your voice has impressed me !! Keep rocking and we are expecting many songs from you. Which movie is your next song with Rahman? Any idea when is the music of Raavan is getting released !? 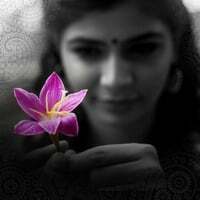 Hi Chinmayi, you are truly awesome...I am just at loss of words. For the past 2 weeks I was thinking, if you could ever know, that I am a biiiiiiiig fan of you, your voice and your songs. Heard your voice on VTV on the song "Anbil Avan", maybe I am wrong, but seems like your voice has been unadulterated this time around and I am able to hear your "original" voice this time around. It is the same voice as in Kannathil Muthamittal and Tere Bina. The song is quite peppy, especially the opening, gets you hooked straight away. Good Job ! Am also Rahman Sir's Fan...and i started following your Blog recently...am relly happy that you are so social ...very few are there who are so open to public..